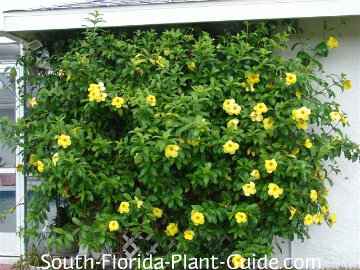 Allamanda vine is one of South Florida's most popular vines for glorious color and ease of care. With big, beautiful flowers as much as 4 inches across, it blooms on and off all year. 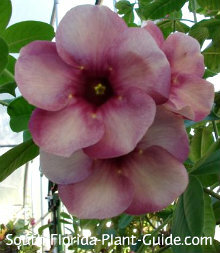 'Brown Bud' allamanda is the most commonly grown variety, with reddish-brown flower buds which open into bright yellow blossoms. Although it's large and fast-growing, this is a well-behaved vine that won't overtake your property while your back is turned. You must train it to go where you want since it doesn't send out twining tendrils. This vine needs some sort of support - or you can grow it as a somewhat rambling shrub, ideal in a cottage garden landscape style. The yellow-flowering vine is the most well known, though there is a variety called 'Cherries Jubilee' with waxy mauve flowers so breathtaking it's hard to believe they're real. Flowers are most profuse during warm weather. 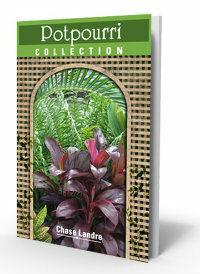 This plant can provide privacy for a pool area, patio or deck. The glossy green foliage of allamanda vine grows thick and full on its woody stems. All parts of the plant are considered poisonous, so avoid placing where small children might munch. If you have sensitive skin, wear gloves when pruning so the sap doesn't cause a rash. Other allamandas include the bush variety and the dwarf shrub. 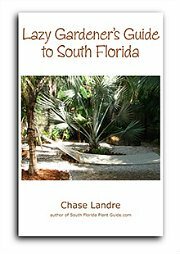 These are tropical vines that need the warm temps of Zone 10. The more sun the better to promote lots of flowers. This vine grows 10 feet (or more) tall with a spread of 5 or 6 feet. As a shrub, you can keep it about half that in height, and about 4 or 5 feet wide. To cover a fence, place plants 3 feet apart. Give enough room so nearby shrubs aren't too close - at least 3 feet away. 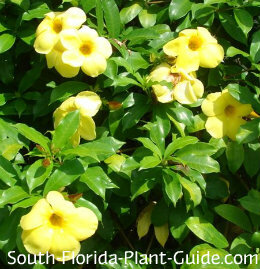 Allamanda vine is considered deer-resistant (though there are no guarantees). Add top soil or organic peat humus to the planting hole. You can also mix in composted cow manure to enrich the soil around the plant's roots. Cut back in early spring (late March or early April) for size. To grow as a shrub you may need to trim it more often to keep it shaped. Water on a regular basis with time for the soil to dry out a bit between waterings. Allamandas like a fast-draining area. Fertilize 3 times a year - in spring, summer and autumn - with a good granular fertilizer. You can supplement feedings with bloom-boosting liquid fertilizer and/or bone meal. LANDSCAPE USES: Vine for fence, wall lattice, trellis, arbor, porch or deck railing; wide-growing shrub.